Hurricane® In And Out™ Mop | Official Site | The Only Mopping System That Cleans And Dries The Mop! The Only Mopping System That Cleans And Dries The Mop! The only mop thatâ€™s as easy as In And Out™! The only mop that's as easy as In And Out™! The more you plunge, the cleaner it becomes! You'll never have to wring your mop again. Hurricane® In and Out™ does the wringing for you. Tired of using your hands to wring out your mop? Even when you wring it out, it still leaves a nasty, dirty trail in its wake. Introducing the brand new Hurricane® In And Out™ Mop - the incredible mopping system that works like no other! READ FULL DESCRIPTION Use the microfiber pad to pick up those tough messes. Then just push the mop head in and out of the washer side. Watch stains disappear! Then put it in the dryer side to wring it dry. You're left with a clean mop that's ready to rock! Thanks to the breakthrough bucket design, the pad goes in dirty, washes clean, and comes out dry each and every time. It's as simple as In And Out™! The secret is in the dual chamber bucket. One side washes out the dirt and mess. The other side wrings it dry. The more you plunge, the cleaner it gets. It goes in dirty and comes out clean. You'll always have a mop with a clean mop head, so you'll always have clean floors. Hurricane® In And Out™ Mop works on all floor types - for a streak-free tile to a polished wood. The soft, microfiber pads lasts for years because it they always stay clean! In And Out™ swivels and pivots to get everywhere, cleaning as it goes. Get your Hurricane® In And Out™ Mop for just two payments of $19.99 plush $9.99 shipping and handling. The mopping system includes the mop, microfiber mop head, and bucket. As our gift to you, we'll include a scrubber pad at no additional cost. But wait! 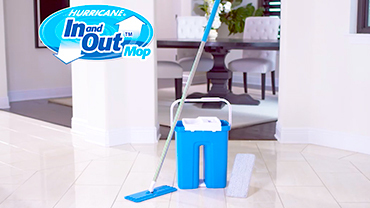 That's not all - double your offer and receive a SECOND Hurricane® In And Out™ Mop system. Just pay a separate fee of $19.99. Hurry - this offer won't last long. Order now! Push the dirty mop head in & out of the washer side, then put in the dryer side. Hurricane® In and Out™ Mop's secret is the dual chamber bucket system. Because you're constantly cleaning the microfiber pads, they last for years! You'll always mop with a clean mop, so you'll always have clean floors. Check out these other great products by Hurricane® In And Out™ Mop. TEXT FOR OTHER PRODUCT OFFERS. Hear from other Hurricane® In And Out™ Mop customers how much they love it, and why you will too! Check out all the news for In And Out™ Mop and its creators at TeleBrands featured all over the world.